I first heard about My War thanks to a controversial advertisement for the movie that briefly soured Sino-Korean relations. In it, a group of Chinese pensioners touring Seoul declare to their puzzled guide that “the last time we were in Seoul, we were carrying the Chinese flag and we didn’t need passports!” The pensioners then exhort viewers to “watch this movie called My War” in order to find out exactly what they mean. Naturally, some South Koreans weren’t enthusiastic about this reminder of China’s involvement (in support of North Korea) during the Korean War. Many Chinese netizens were also embarrassed at the ad’s insensitivity. Controversial ads aside, the actual movie isn’t particularly nuanced either. My War’s plot is bland and uncreative. It begins in late 1950 when China first enters the Korean War. As they’re being shipped off to the front, a company of soldiers led by a commander named Sun Beichuan bumps into a cultural brigade led by a female officer named Meng Sanxia. The two units become close as, together, they fight to push American forces south of the 38th parallel. Where’s the conflict? Where’s the drama? Other than killing Americans and the heroic sacrifice of characters who haven’t had adequate time to develop, there’s no momentum to the movie. It literally cuts from segment to segment using titlecards as a crutch. Other than protecting the motherland and formulaic, surface-level demonstrations of camaraderie, we’re unable to empathize with what keeps these characters fighting. Even the romantic subplot between Sun and Meng feels forced, captured straight from a second-rate Korean drama and forced to perform at gunpoint. Probably the only reason you should see this movie is if you want to see lots of explosions. My War provides a constant stream of high-octane action ranging from aerial bombardments, artillery strikes, anti-tank warfare, mass frontal charges, and more. The film takes great inspiration from Michael Bay: besides the obvious explosions, many scenes consist of quick, heavy-handed cuts between shots lasting no more than a few seconds. On the note of technique, it’s also quite intriguing how My War liberally employs shots that mimic the “first person shooter” video game perspective. Puzzlingly, it even goes beyond that by having “reverse FPS” shots where a camera is attached, pointing backwards, on a gun’s muzzle. Heavy jingoism and casting America as the villain do not necessarily make My War a lackluster movie. Rather, it’s bad in the same way that Transformers is bad: heavy on things blowing up, light on a meaningful story. If the Chinese and Americans switched sides in this movie, it would be just as disappointing. Unless you’re bored and need more wanton violence in your life, there are other much better Chinese film about the Korean War (ex. 2007’s Assembly) out there. 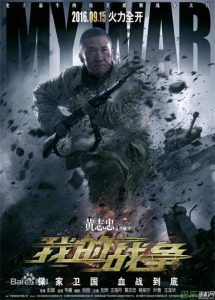 My War (Chinese: 我的战争) — China. Dialog in Mandarin. Directed by Oxide Pang. First released September 2016. Running time 2hr 4min. Starring Liu Ye, Wang Luodan, and Huang Zhizhong.